On Tuesday I had posted the first part of this two-part interview with Ellen Denny who currently plays Anne Shirley in the Anne & Gilbert: A Musical at The Guild in Charlottetown, PEI. The show is running until October 12th, so if you are considering a out east, make sure to go. Here’s the link to buy tickets. And for those of you who have commented or tweeted or gotten involved in this discussion, I want to thank you. We all like to know that what we’re doing is speaking to people and I’m glad that you’ve found something special in this series so far. Today, Ellen and I discuss more about Anne, as well as her thoughts on many people’s first book crush (including my own) Gilbert Blythe, and what it is like to play opposite the actor, Patrick Cook. Ellen: We are actually lucky enough to have six shows a week this year, although I did do eight shows a week of Anne & Gilbert all last summer, which was intense. It makes a big difference to only have to do the show once a day, because it is an enormous journey to go on each time. Having a “bad day” at work is not really an option for me, so that can feel like a lot of pressure. To manage it I do a lot of yoga, and a proper physical and vocal warm up before pretty much every show. It is my fellow cast mates and awesome audiences who feed me every show. Each show has its own energy, and once it starts I don’t have a lot of time to really think about how it’s going –I just do it! The huge emotional discovery that Anne goes through at the end (after the discovery of letters written by her parents) is probably the hardest thing to keep fresh over the long run. It’s those moments where the audience really helps me, because I sense how it’s affecting them to experience it for the first time, and that in turn is very affecting on me as an actor. Mel: I’ve talked about the importance of yoga here, too. It seems essentially for creative people in helping us get centred. Also, the relationship between actor and audience is interesting because for writers we often talk about our relationship with the reader but we only see the reaction after the fact (if ever), not during, so it is hard to develop that interaction and feed off of that. 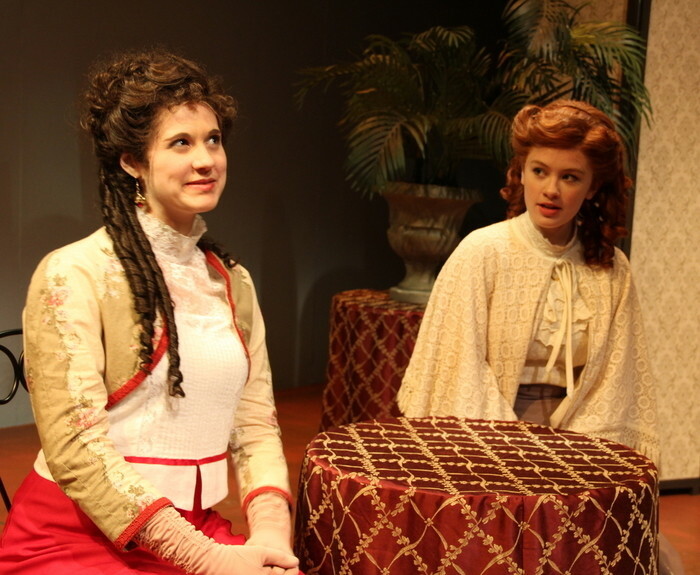 Morgan Wagner as Philippa Gordon & Ellen Denny as Anne Shirley. Mel: How you might discover something new each time you play Anne. Does that happen? Like when a writer revises a scene, each time we might discover something about character. Ellen: I can’t say that it happens every single time, although maybe it does on a subconscious level. I work very hard to make it feel like the very first time each time I do it, but after having been with the role this long, I find that about once a week something new suddenly jumps out at me. These are my favourite moments, and for me they are what makes being an actor so wonderful. It’s as if I suddenly have a thought purely as ‘Anne’ and not as the actor ‘Ellen’. Magic. Mel: That honestly gave me shivers. “Magic.” Being so immersed in character that you are thinking like them, being them. What is it do you think resonates with people about Anne Shirley that they continue to return to her? How do you think that your production of Anne and Gilbert enhances people’s interpretation of her? Ellen: At first I struggled with the scenes where Anne is not at her best – when she humiliates Josie to gain control over the class on the first day of school; when she teases Gilbert about his feelings for her, and then brutally rejects his first proposal. I was worried somehow that the audience wouldn’t like Anne because of those parts. Then I realized that we all love Anne so much because she’s flawed. She never intentionally tries to hurt anyone, but she makes a lot of mistakes along the way, and that’s okay. It’s what makes her so human, and so relatable. I hope that this production offers people the opportunity to watch Anne blossom from the precocious and dreamy orphan girl we know and love, into a young woman who has come to terms with her past and knows exactly what she wants in the future. Mel: I totally think so and why this interpretation of Anne works so well in this production, because we do see that arc. Your first point about Anne’s supposed negative qualities. This is something that many writers (including myself) worry about when writing our protagonists in an unflattering light. But you’re right, if the character is multidimensional, then people will like them for their flaws. Along those lines, what do you think are the qualities in Gilbert Blythe that make him so attractive for viewers/readers? Ellen: His patience and devotion to Anne is pretty awe-inspiring. He is so sure that she’s the one, but his love is unselfish, he just truly wants what’s best for her. In some ways he knows and understands her better than she does herself. And then there’s the whole irresistibly charming and handsome factor, which is more prominent than ever in Patrick Cook’s rendition! Mel: Well, that does seem to be the chatter in my circles. But I have to say, compared to the other productions of Anne & Gilbert that I’ve seen, there is such a palpable chemistry between you and Patrick. How did you both work together to create your relationship on stage? Ellen: Falling in love with Patrick’s Gilbert is probably the easiest part of my job. I don’t know how to explain our chemistry because it’s just something that’s always been between us since the first time I acted with him. Patrick Cook and Ellen Denny in Sweeny Todd. I’m just grateful that after so many performances it seems strong as ever! As actors I think we know how to support each other 100% when we’re onstage together. Beyond the aforementioned special spark, finding Anne and Gilbert’s dynamic was pretty easy because like them we are naturally competitive, very close friends, who know how to press each other’s buttons, but also how to bring out the best in each other. Mel: So interesting how your respect for one another and trust really supports that dynamic. But, what is it about Anne and Gilbert’s relationship that draws people in? Ellen: I think it’s the inevitability. Everyone can see they are perfect for each other and yet they take an infuriatingly long time (mostly due to Anne) to get together. They are wholesome and good-hearted young people, yet they ignite a fire in each other that is captivating to watch. Our audiences love watching Anne and Gilbert tease and provoke each other in our first scene almost as much as they love the kiss(es) at the end. Mel: Yes, I have to admit, it is totally enjoyable to watch. The kissing, too…I think it adds a dimension to their relationship that is only hinted at in the books but we don’t necessarily see. Truly brings the relationship to a modern audience. And now, I would love to know a little bit about Ellen. What is currently on your playlist? Ellen: Basia Bulat, Arcade Fire, and Frank Sinatra. Mel: Love it. I am enjoying the track, “Heart of My Own,” by Basia Bulat. Thanks for introducing me to her music. And thanks so much to Ellen for participating in this series. She has honestly given me so much to think about and has definitely helped inspire me as I continue to find my way into embodying my own characters. I look forward to seeing her in other productions. Now, on August 5th, Patrick Cook will be on the blog talking about Gilbert Blythe. Given what Ellen has just said, and having already seen his answers, I know you will not want to miss it. This entry was posted in Anne of Green Gables, Embodying Character Series, Inspiration, L.M. Montgomery, Literary Book Boyfriends, Theatre, Writing, Writing Life and tagged anne and gilbert, anne and gilbert: the musical, anne of green gables, Anne Shirley, Arcade Fire, Basia Bulat, ellen denny, Embodying Character Series, Frank Sinatra, Gilbert Blythe, Inspiration, l.m. montgomery, patrick cook, prince edward island, Sandra Nickel, Writing process, yoga. Bookmark the permalink.